Barbie and Ken found love again in their 60’s! It was two small worlds colliding when Ken’s former Stanford fraternity brother knew Barbara’s late husband and brought them together through a blind date. Just like in the world of Barbie and Ken the plastic icons, these two immediately fell head over heels and knew they were soul mates. Ken was a former UCLA professor but the couple now live in Santa Fe, New Mexico. Avid food, music and outdoor lovers, they enjoy golf and wine tastings. 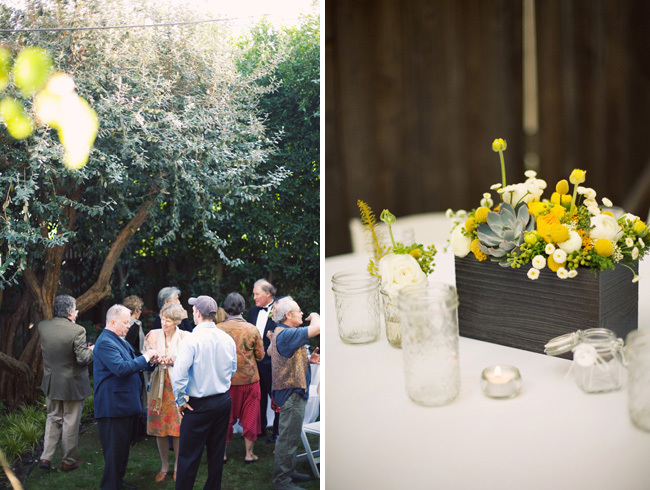 They travelled out to Los Angeles for a backyard affair at Ken’s daughter Rachel’s home in West LA. They brought on bash, please to create their wedding celebration from start to finish. It was an emotional, yet laid back affair with dancing on the deck well into the night. The fabulous Bonnie Tsang was there to capture it all. 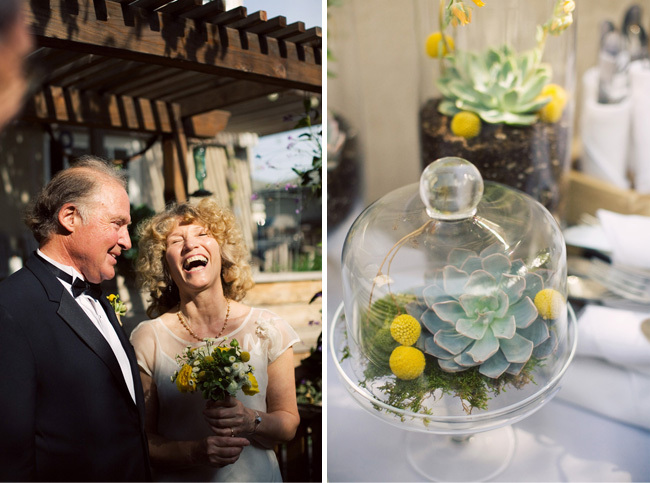 The day was such a fun throwback wedding, mixed with modern day love and family care. 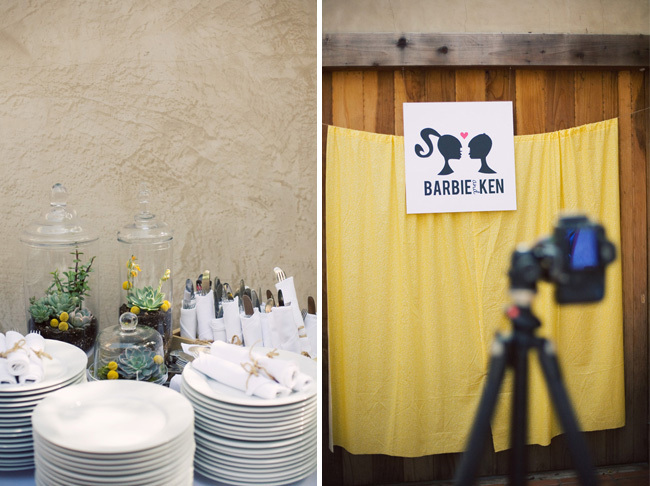 Kelly re-created the retro Barbie and Ken logo that we used on all signage and as the photo booth icon. Of course, we had to pull in the actual Barbie and Ken (Adam and Eve version) for the sign in table, which became quite the talk of the wedding. 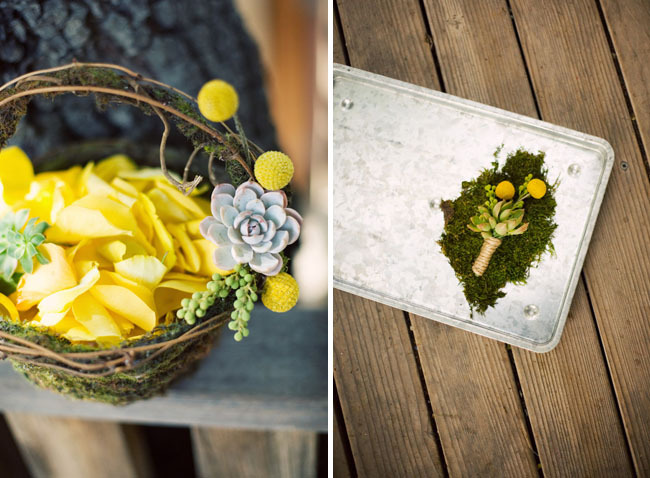 Barbie wanted yellows and greens for her florals, so Kellyused her signature succulents mixed with pops of yellow to complement the California native plants in Rachel’s backyard. Paige hand stamped and crafted pink heart and logo stir sticks and sewed a yellow backdrop for a DIY photo booth that hung in front of the garage. Byron Thames brought the backyard to a full on dance party with beats from the 60’s to modern day favorites. Local, seasonal fare was prepared by Rasa Foods and Bittersweet Treats created the perfect rustic lemon cake. 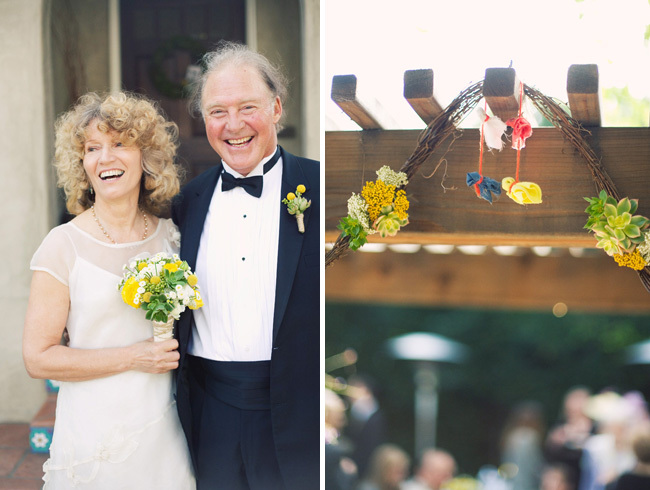 This is a beautiful and fun wedding! 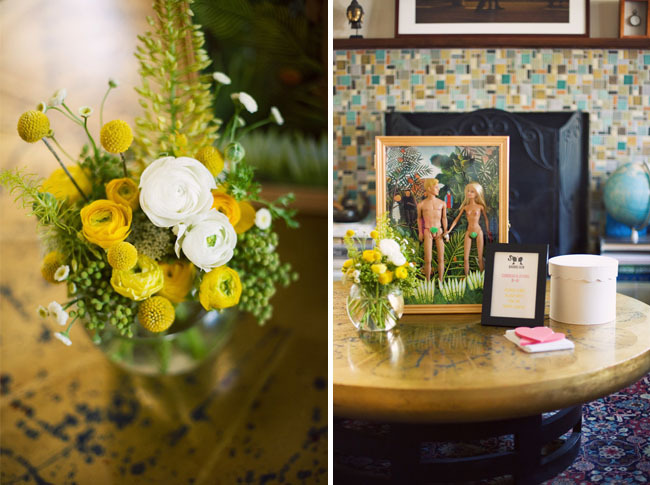 I adore all of the flower arrangements – they are so unique. This is too cute! Just perfect. These two are absolutely adorable. 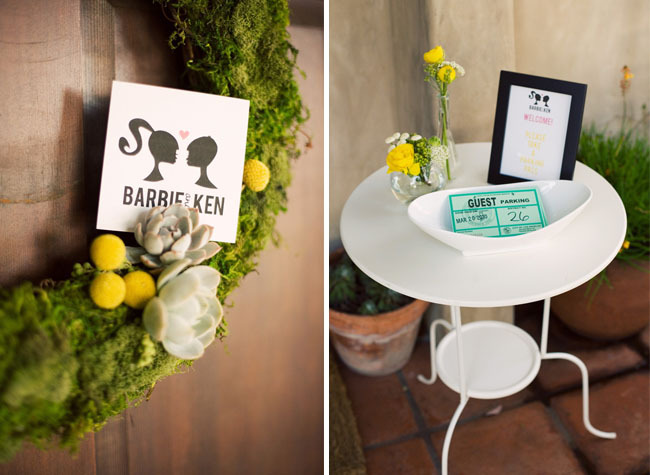 Love their casual, modern wedding with retro touches! love all the details with this wedding! omg could it get any cuter?! LOVE the silhouette logos. and that shot of them laughing is so beautiful! Oh, Barbi and Ken! how great and adorable is that. and isn’t it wonderful that happiness can be found through the years? How cute are they? Bonnie captured everything beautifully, as she always does. 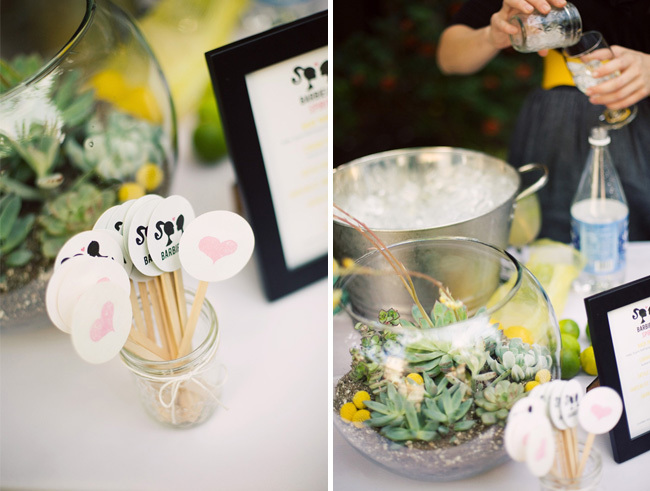 Ok I have to say that this wedding has ALL the elements to be called, adoraaaable!! What a fabulous event! Never before have I wished so much for my name to be ‘Barbie’! 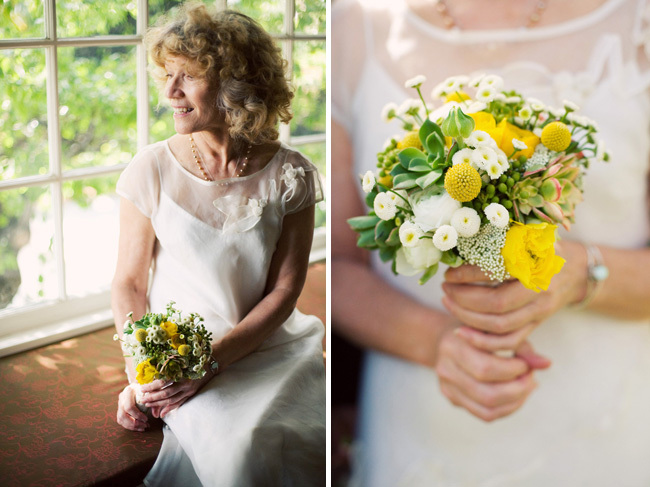 it’s amazing how beautiful floral design can bring together such a simple affair! everything was done just beautifully. 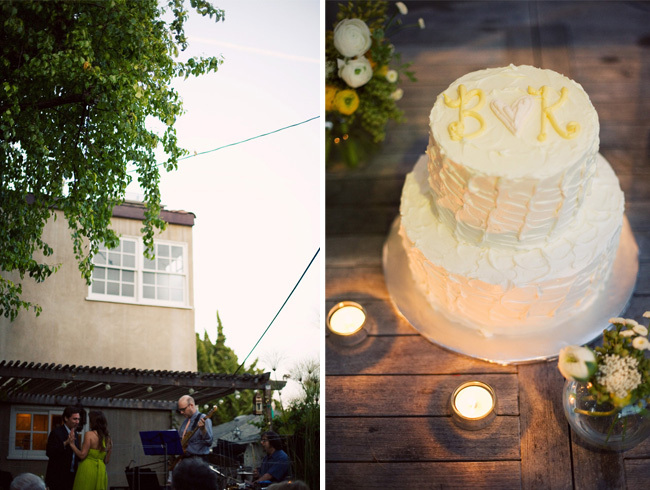 love this backyard wedding!! i want this – so simple and lovely. I know a Barbie & Ken husband and wife also! What are the chances? oh how adorable! i love those stir sticks! the cutest. This couple rocks, and so does their wedding! That’s so cute! Barbie and Ken. just can’t wait also the upcoming release of Toy Story 3. Barbie and Ken. Lovely theme. I love seeing older couples in love. It just confirms that love will be just as lovely when older as it is for a twenty-something. So wonderful. This is one of my absolute favorites! The florals are so fresh and modern. And the Barbie and Ken logo!! What a beautiful couple. So beautiful, just perfect. And the flowers were just amazing. I love how the yellow pops. 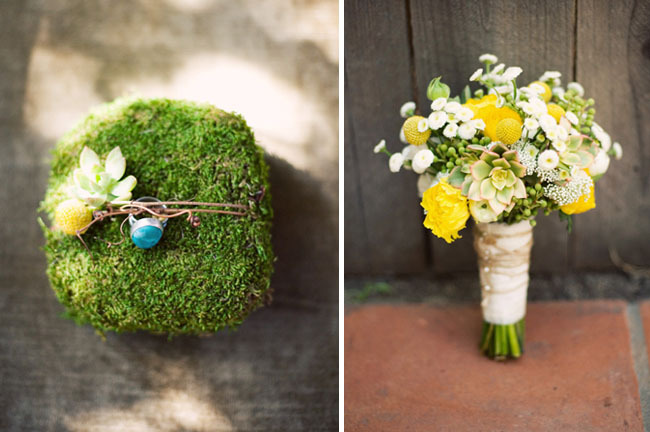 Does anyone know what those yellow flowers are? *squeal* So cute! I love the modern-vintage aesthetic and the choice of colours (my very favorite). Also, it is lovely to see a couple who isn’t 20-something represented on the world-wed-web. I wish them all the happiness in the world. Oh…and to live in Santa Fe! Pingback: put it in print.